Just kidding! 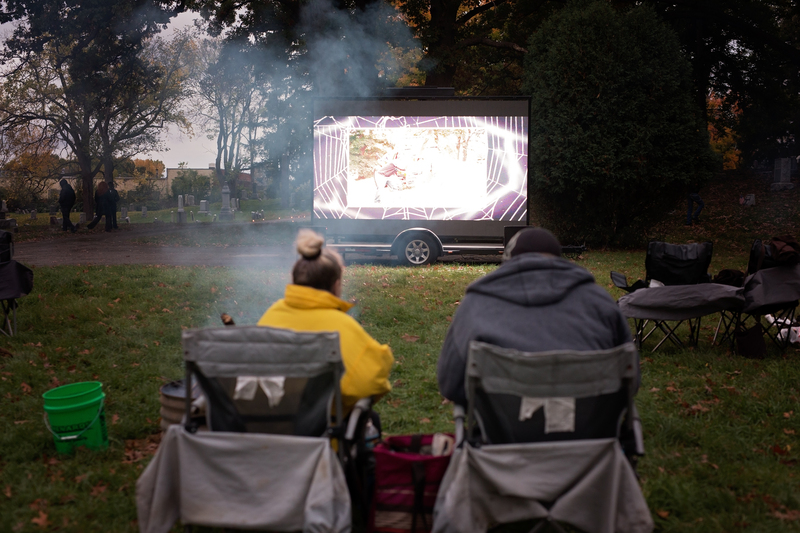 It was our first Movie in the Cemetery! It was a chilly day but we had an awesome crowd that braved the cold to watch Night of the Living Dead. The ghost of our old grave digger, Mark Gilbert, greeted guests at the main gate. And by ‘greeted’ I mean he measured them for any holes he’d have to dig later that night. Regina Gilbert, Redford Twp Historical Commission board member, got everyone checked in and sent them down the candlelit path to the movie area. A huge thank you to volunteer Kate Meadors-Young for helping us out all night! mmmmm popcorn. Four fire pits helped keep everyone warm as they settled in during the “previews”. If you weren’t able to make it to the movie, you can watch the previews HERE. We were excited to surprise everyone by raffling off door prizes, which included gift cards, Detroit Pistons tickets, and Detroit Red Wings tickets. We had an awesome time – hope to see you again next year! Our mission is to preserve Redford’s history, whether it’s with research, education, or good ‘ol manual labor. Taking care of our historic cemetery can be a sweaty job. I always refer to the grounds maintenance as a “free workout”, so it’s a win-win. Preservation not only takes time (LOTS of volunteer hours) but money as well. Special supplies are needed to protect documents, photos, and artifacts from deterioration. In addition, many of the stones in the cemetery are in desperate need of repair.